We discovered in the ferry-house at the top of the long staircase leading down to the ferry opposite the Clifton Hotel, a daguerreotypist's emporium, whose wares consisted of correct views of of the Falls taken from various points of observation, as also a number of the luckless Dutchman as he appeared in the boat which had lodged in the rapids leading to Iris Island, and who was hurried over after remaining there some forty-eight hours. Several months ago, another view presented him as he was plunging towards the brink of the Fall, his arms wildly, hopelessly tossed towards heaven. Such morbid and depraved tastes for the awfully tragic is peculiar to the other side. Fancy such a picture contributing to the embellishment of a drawingroom! It is disgusting; lamentably so! 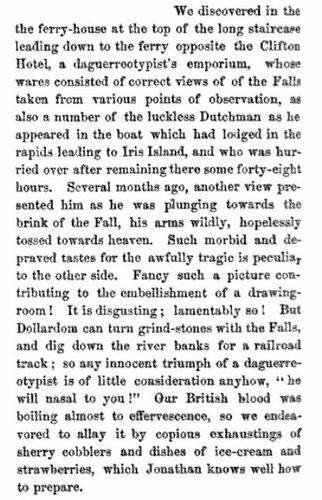 But Dollardom can turn grind-stones with the Falls, and dig down the river banks for a railroad track; so any innocent triumph of a daguerreotypist is of little consideration anyhow. "he will nasal to you!" Our British blood was boiling almost to effervescence, so we endeavored to allay it by copious exhaustings of sherry cobblers and dishes of ice-cream and strawberries, which Jonathan knows well how to prepare.